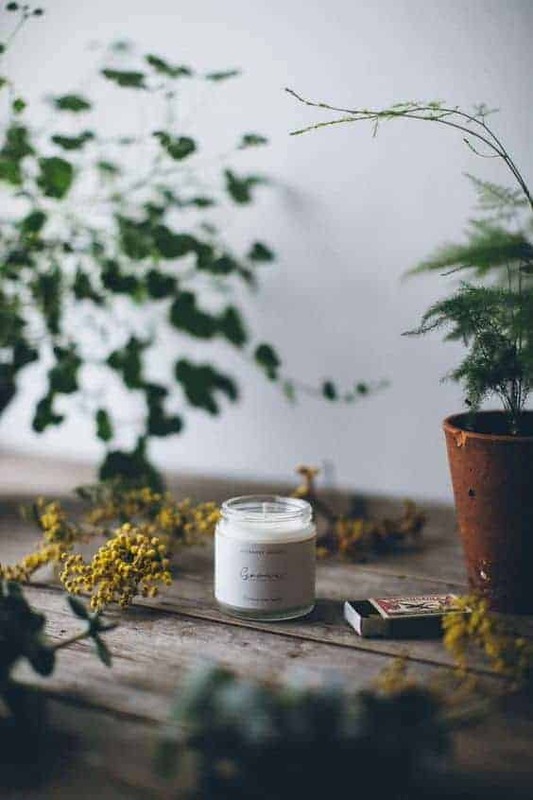 Handmade soy aromatherapy candles I love – ethically made with natural essential oils and pure, natural plant based ingredients including soy, coconut and rapeseed plant waxes. During the long, winter evenings in January and February I love to light natural, aromatherapy candles. Handmade soy aromatherapy candles probably – or possibly coconut or rapeseed wax. Plant-based at any event and certainly petrochemical free. They bring soft light and warmth into the darker hours and I just can’t get enough of them. Probably why I always receive at least one or two for Christmas – and this year was no exception. I dropped heavy hints about this beauty from The Future Kept (listed in our directory here). I wasn’t disappointed. It has burned beautifully throughout the festive period – and is still going strong. The fragrance is warm, earthy and just the right side of spicy for me. As I write this, it’s flickering on a little table near me and the rest of the room has slipped into darkness as I tap away. I feel like I’ve created a slightly magical and fragrant world all of my own. I will re-use the pretty little ceramic lidded jar when it’s finished, so it’s a zero waste buy too! It was Jeska’s description that sold it to me (Jeska Hearne and her husband Dean are the talented pair behind The Future Kept. 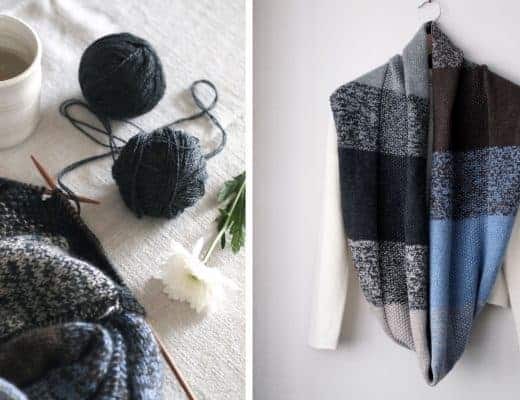 You can discover Jeska’s local loves in her blog post about Hastings for us here): The quintessential spirit of winter. The traditional aromas of clove-studded oranges and the warming scents of nutmeg and cardamon. Just a hint of ancient myrrh and the crackle of the wooden wick, the perfect scent for the festive season. 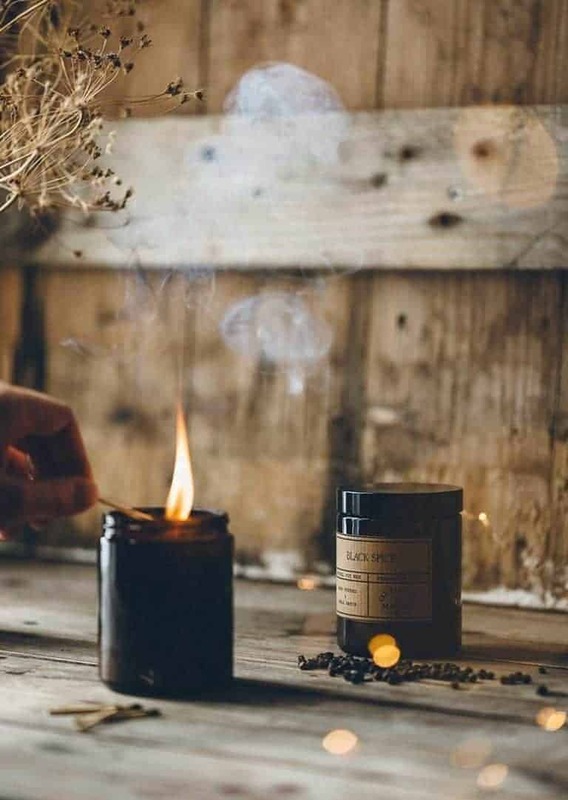 My husband has a new studio, so I’m planning to buy him this Black Spice candle handmade in Lancashire (where I grew up) and also from The Future Kept. 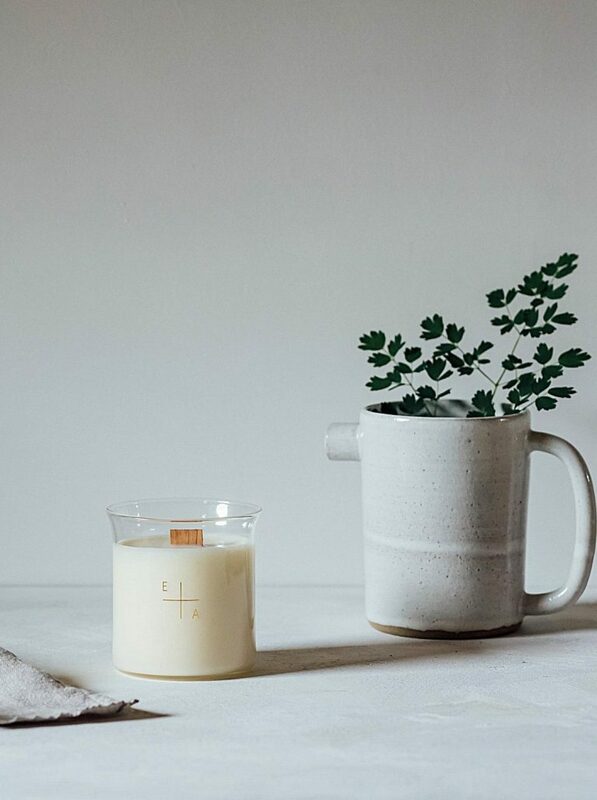 This got me thinking about the whole subject of handmade soy aromatherapy candles and zero waste so I thought I’d share some of my favourites with you. Other lovelies from The Future Kept include the wonderful Restore candle by Essence + Alchemy. Evermore London creates a range of sustainable soy handmade aromatherapy candles as well as some using coconut wax – all hand-poured candles, also available from The Future Kept, including Tides which is an exotic combination of wild fig and cedar along with thyme essential oil, reminiscent of a walk through the forest down to a summer beach. Hand made using essential oils and toxin-free fragrances. 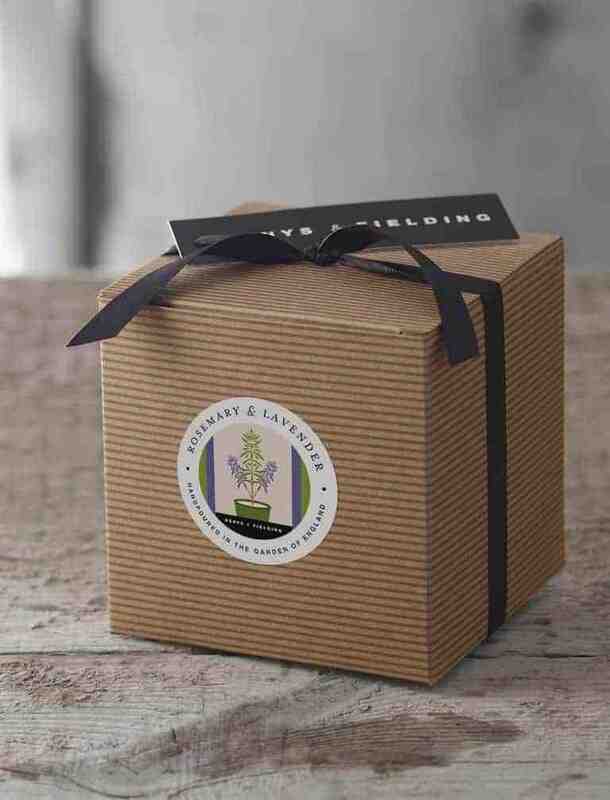 Denys & Fielding (listed in our directory here) have just brought out a brand new range of refillable outdoor candles with a lovely back story. 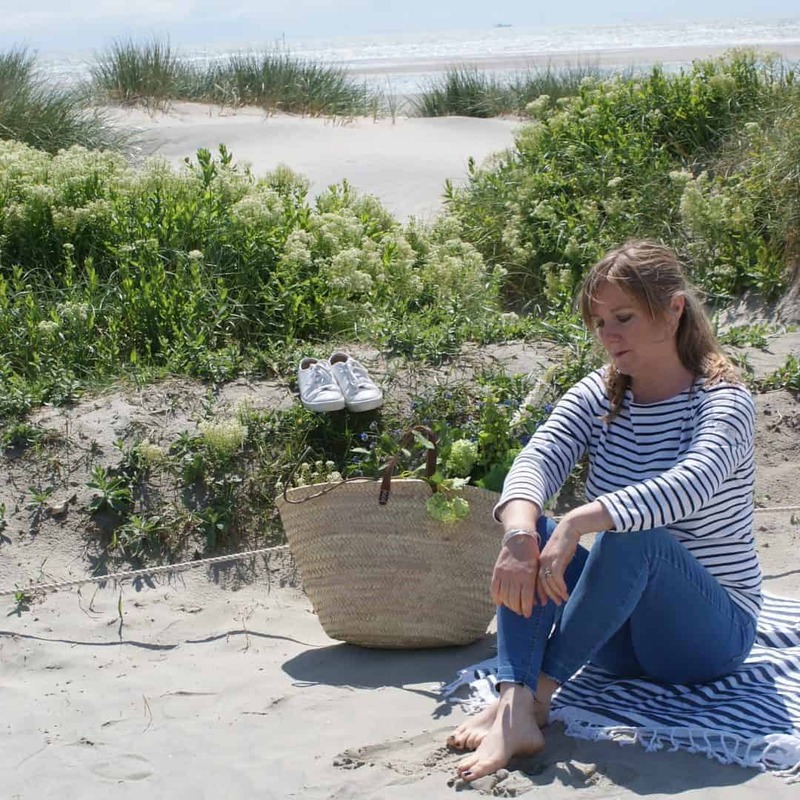 Founder, Liz Ridgway and I share a passion for our gardens – and sitting out there to enjoy them in all seasons. 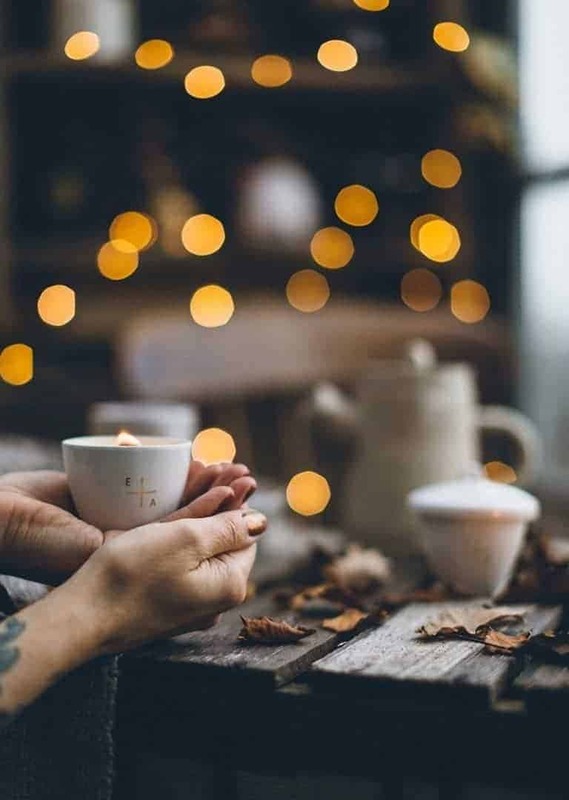 Fire pit lit, candles flickering, blankets if needed in Winter… It was her love of candles that led Liz to learn how to make them at a workshop last Summer. She enjoyed the process – and the results – so much that she set out to create her own range of hand poured 100% natural outdoor candles. The new collection has just launched and I wanted to share them with you. The enamel pots are such a great idea – perfect for adding to an outside garden table or ledge. I also love that you can cut down on waste by sending your empty pots back for a refill. Liz puts her heart and soul into what she does and it’s clear that her new range of candles is no exception. Read more about the story behind them here. 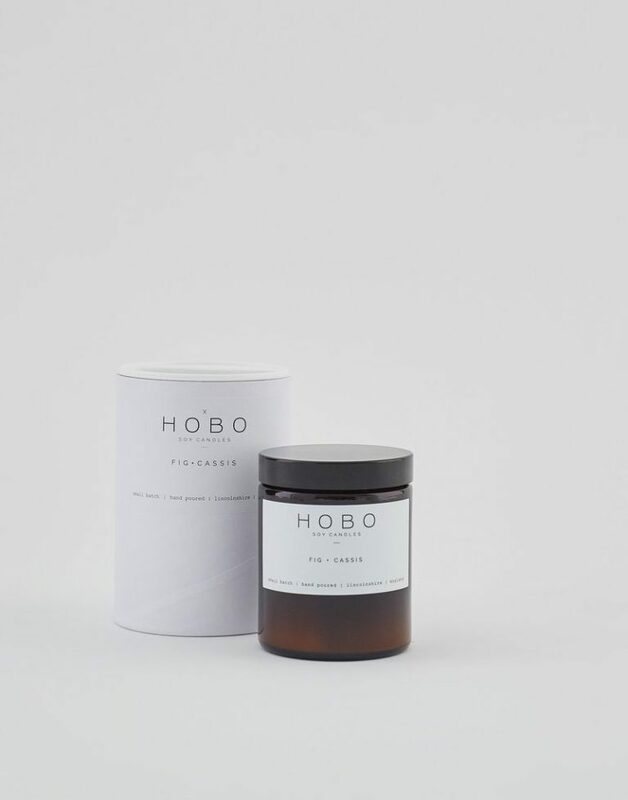 The candles come in a reusable, enamel container, which is available in two colours – grey or green. 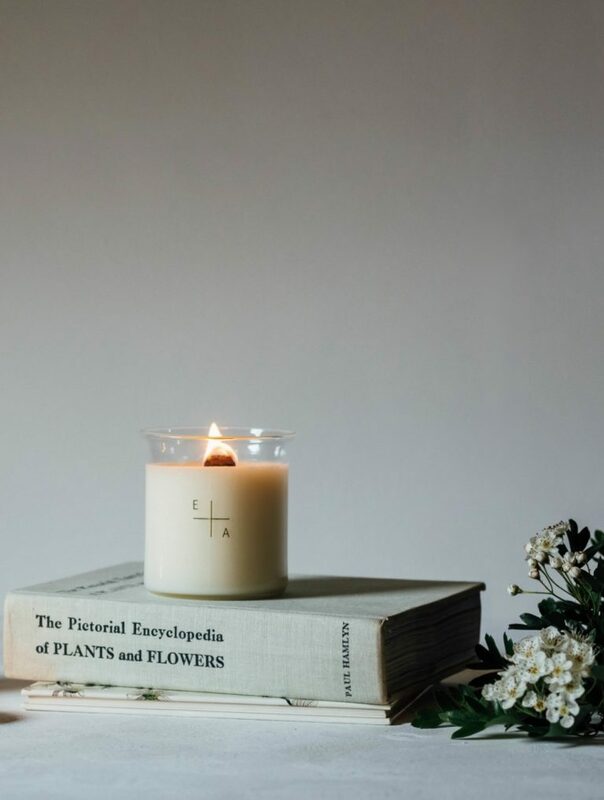 And of this herbier option, Liz says: Inspired by French potager gardens, our Rosemary and Lavender candle is evocative of the traditional kitchen garden. Rosemary stimulates and relaxes, while Lavender is well known for it’s soothing qualities. 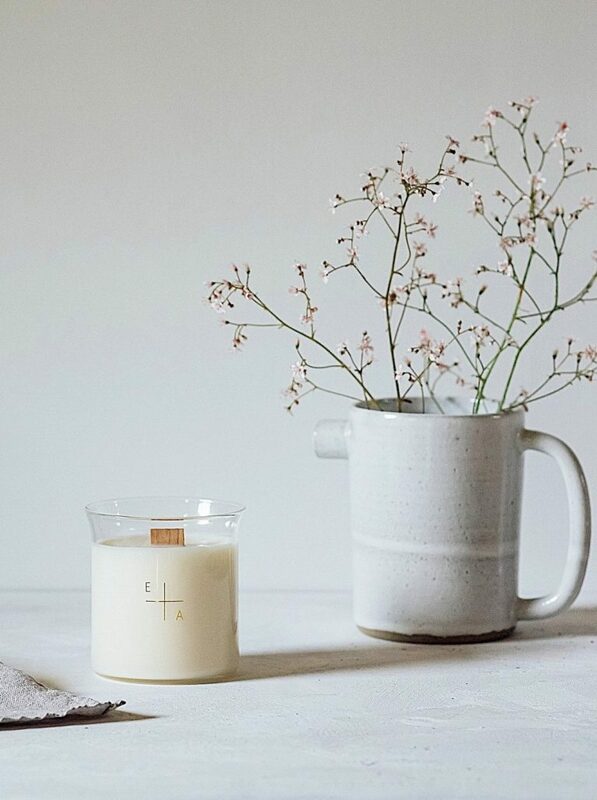 Together our blended candle, made only with essential oils and natural soy wax, produce a beautiful, distinctive scent, made to enjoy either indoors or outside. Our candles are produced with wholly natural ingredients. Essential oils, soy wax and no nasties. 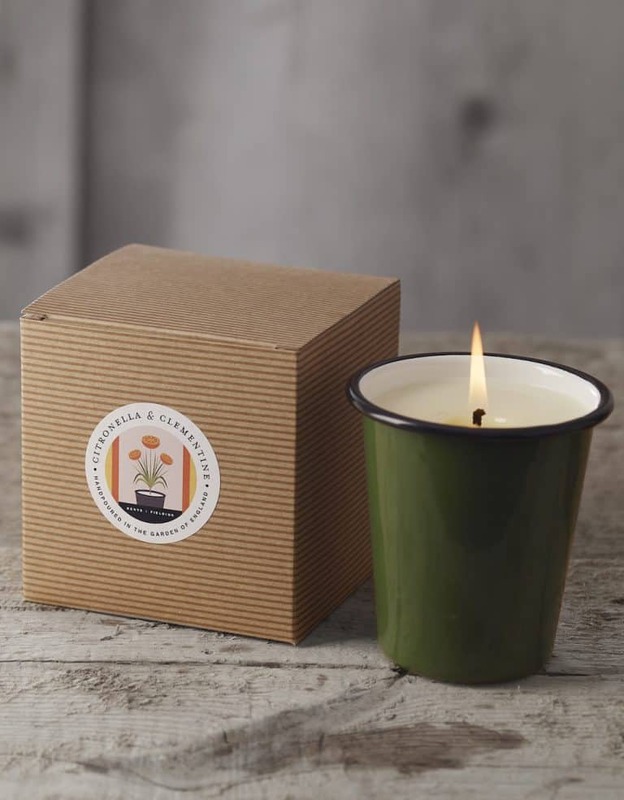 Presented in beautiful enamel containers which can be refilled, using our candle refill service, or used as a container for a host of other things in and around the home, this lovely, natural candle is wrapped in tissue paper and packaged in a sustainable brown box, to make a beautiful gift. 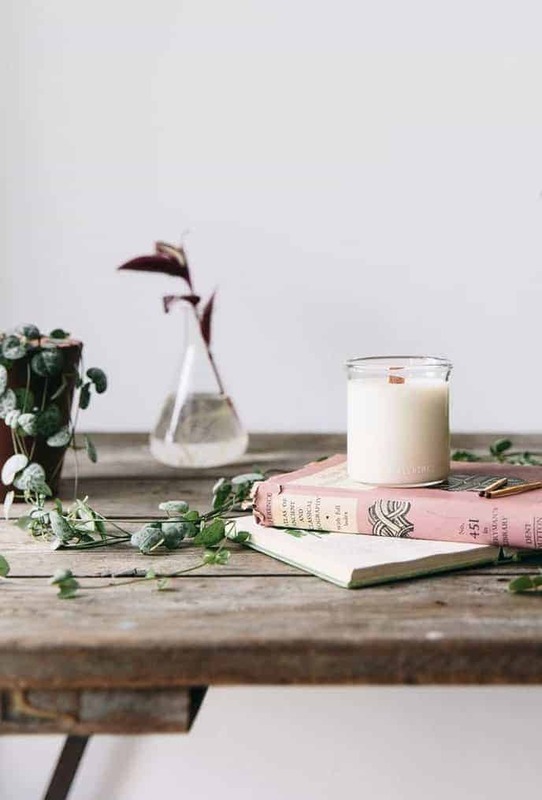 I have loved this range of beautifully made refillable glass beaker candles for years (Essence + Alchemy is listed in our directory here). 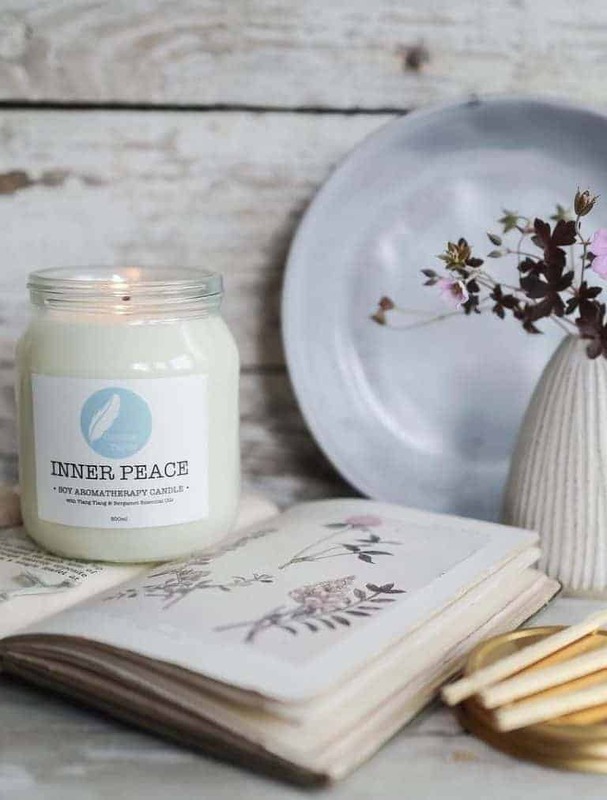 Handmade in small batches with plants and essential oils, this range of scented candles and diffusers is 100% natural, ethical, sustainable, cruelty free and earth friendly. The difficult bit is narrowing down your choice. 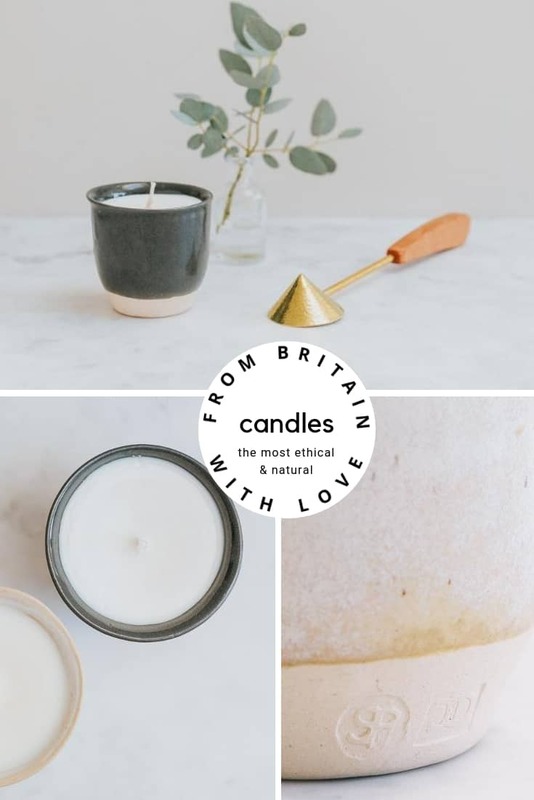 The candle is hand poured into a British made hand-blown glass with a wood wick, which when lit will crackle and glow giving out a warm, uplifting and relaxing atmosphere. 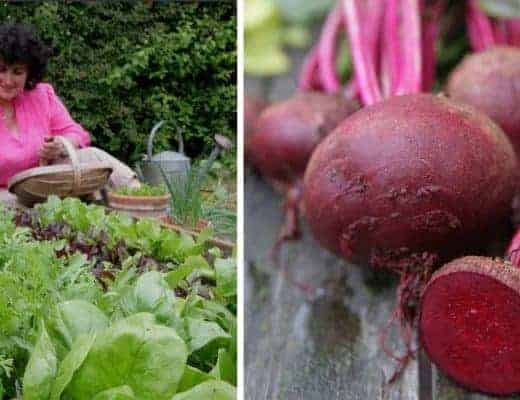 Based in Brighton, Corinne Taylor (listed in our directory here) is a qualified aromatherapist and passionate about all things natural and organic. 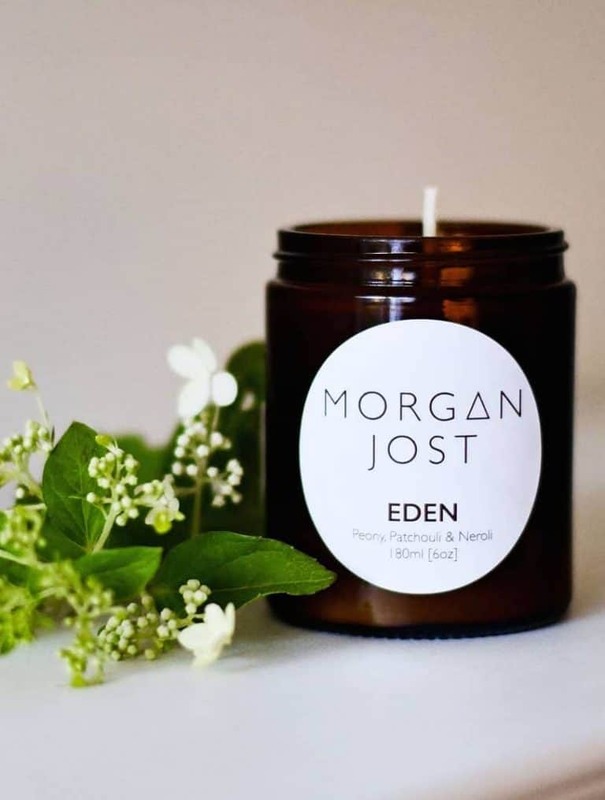 She also has a nifty eye for packaging in my opinion and I love her range of natural skincare as well as her 100% natural, vegan and cruelty free aromatherapy candles. All are chemical free and scented only with essential oils, which as well as smelling beautiful, also offer therapeutic benefits for mood and wellbeing. A refreshing, grounding scent, rich with citrus notes and a hint of the forest. 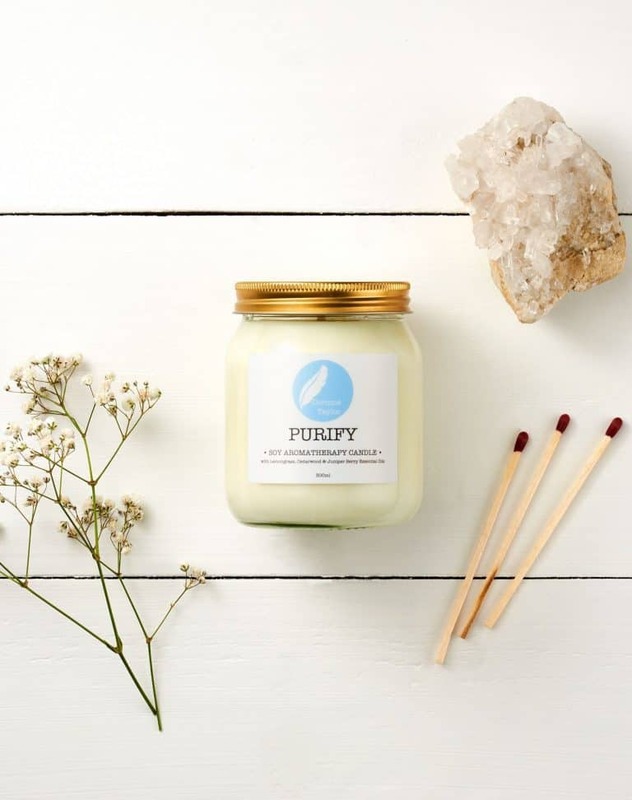 Our all natural Purify Soy Aromatherapy Candle is made with essential oils of Lemongrass, Cedarwood & Juniper Berry to help uplift your mind and purify the air in your home. Corinne uses only 100% pure essential oils in her candles with many therapeutic properties which will be released into the air when burnt. Soy wax is cleaner than other waxes, burns longer, and is free from harmful toxins and chemicals. It contains no carcinogens or pollutants which means it is less likely to trigger allergies. This Candle is contained in a screw top glass jar which can easily be washed out after it’s finished and kept for your own use or recycled. A calming, relaxing aroma, rich with floral and citrus notes. 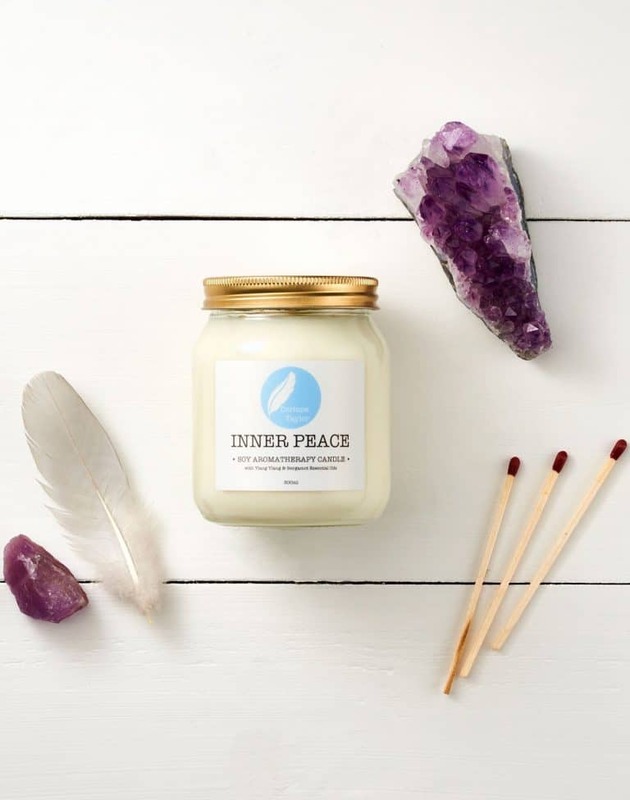 This all natural Inner Peace Soy Aromatherapy Candle is made with essential oils of Bergamot & Ylang Ylang to bring in relaxation, tranquility and calm. 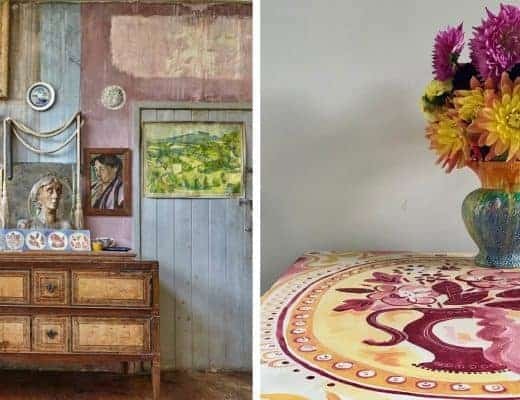 Always, always worth a browse when looking to source ethically produced loveliness is Aerende (listed in our directory here). I love what founder, Emily, has set out to do. 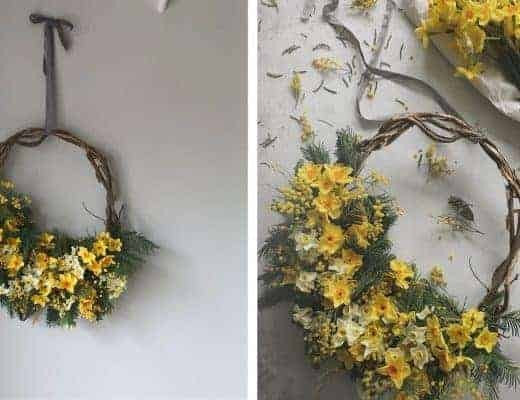 She has created a lovingly sourced collection of handmade items for your home. Aerende is also a social enterprise. All products are created in the UK by people facing social challenges, produced in low-volume batches and designed to improve with age. Love this scented Rapeseed wax candle pot with specially designed limited edition fragrance for Winter 2018/19. Handmade at a residential community in Gloucestershire supporting adults with learning disabilities, the beautiful pots are filled with wax that has been scented and poured by a social firm employing adults with learning disabilities in Brecon, Wales. Scented with ylang ylang, neroli and balsam copaiba to destres with petitgrai to uplift. The pot is an object of beauty that will live on well after the candle is finished. Emily put hours of research into creating the most ethically made candle possible. Packaging is made in the UK, fully recycled and recyclable. 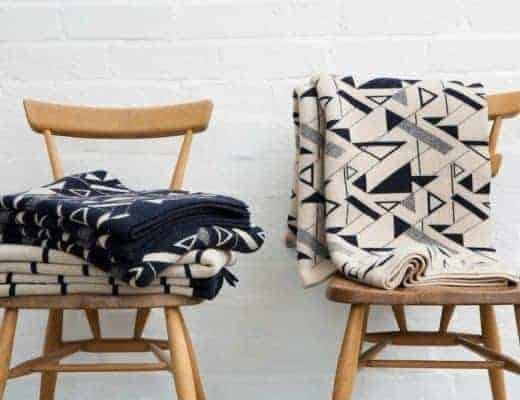 Listed in our directory here, La Juniper is an online shop with the aim of selling well-chosen gifts and homeware with a focus on conscientious consumerism and a mission to support British makers as well as ethical craftsmanship. 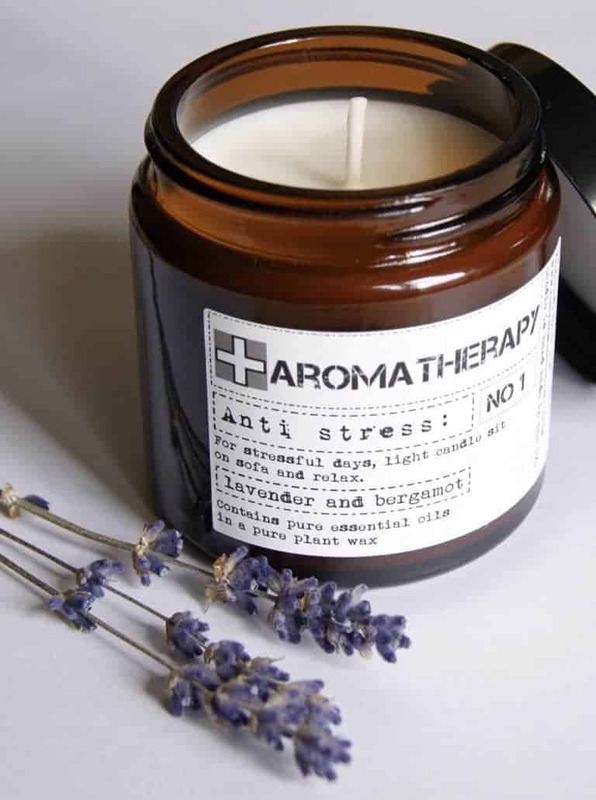 There is also a selection of handmade soy aromatherapy candles including this Anti Stress one in a handsome brown glass apothecary jar. 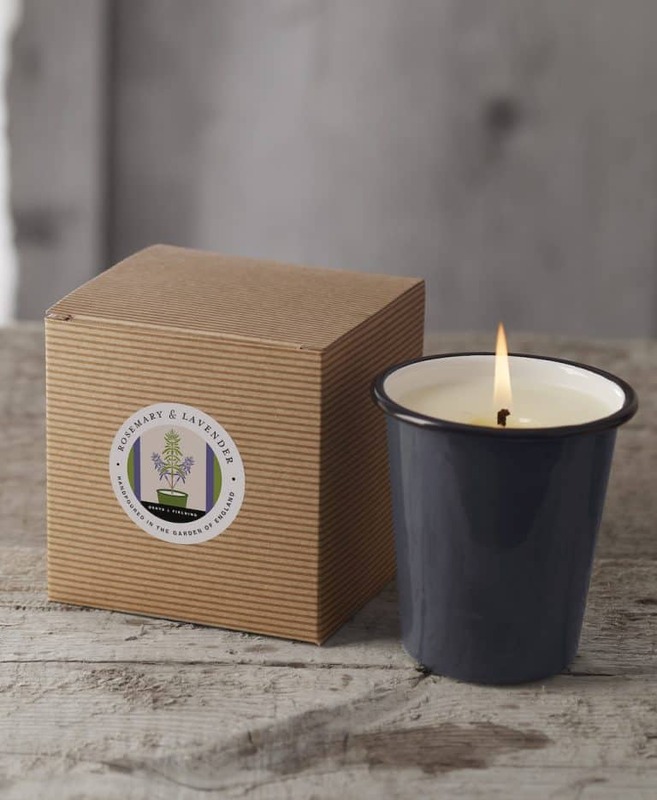 This is a great value handmade soy aromatherapy candles ethically made in the UK using sustainably sourced natural plant products and essential oils of lavender and bergamot to de stress, relax and uplift. 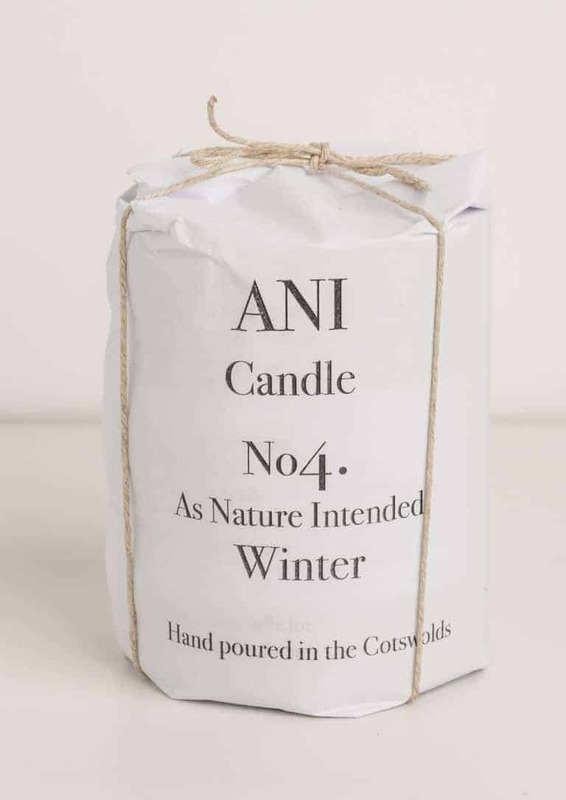 Standing for As Nature Intended, ANI (listed in our directory here) makes candles that are 100% natural, hand poured and beautifully packaged. ANI No 4. Winter Candle is warm and sultry aroma combining essential oils of Cedarwood, Vetivert and Pine with Sweet Orange. 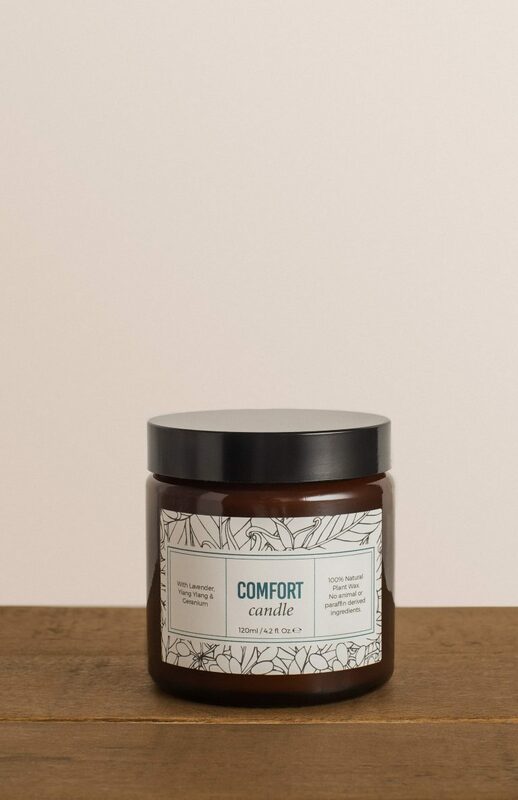 Made with the finest, sustainable soy vegetable wax and a blend of pure essential oils, carefully combined to create balance and harmony and to cleanse the air. 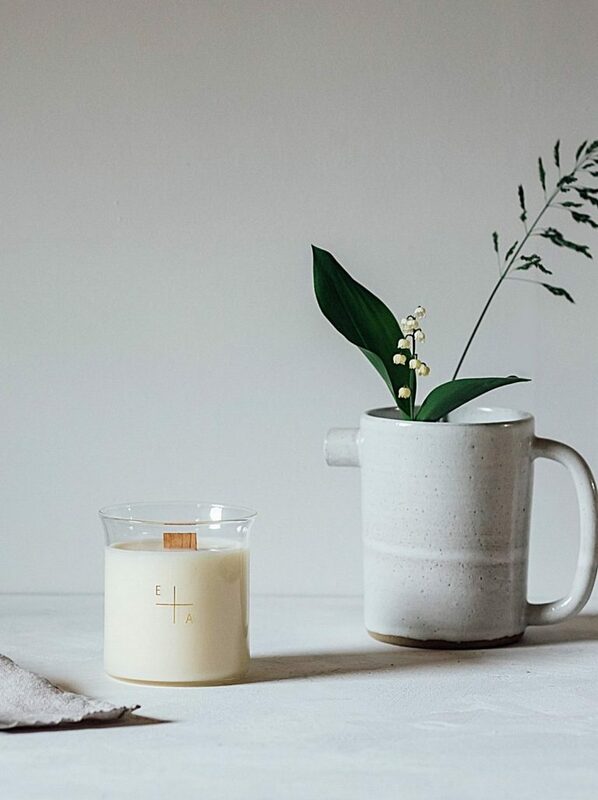 Ethical online shop Wearth London (listed in our directory here) sells these lovely handmade soy aromatherapy candles, hand poured in Oxfordshire, using organic soy wax. Natural paraben free essential oils and organic cotton for the wick. 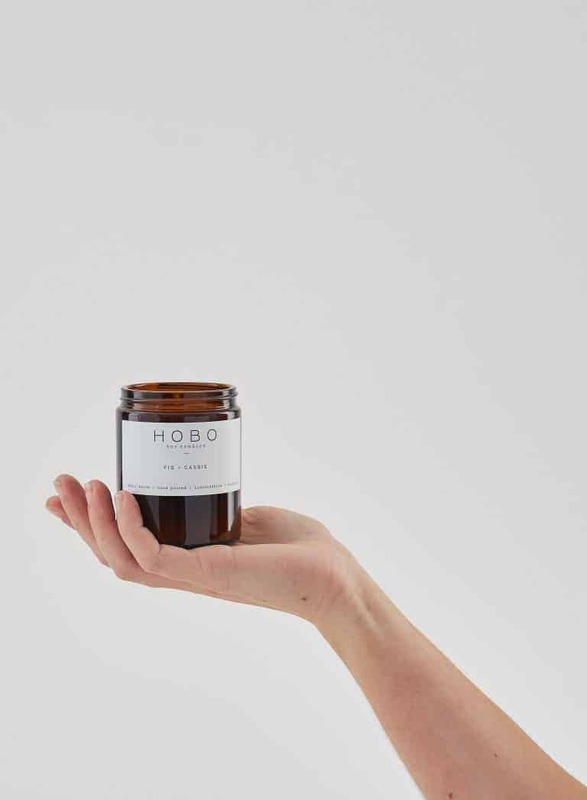 As well as selling her own beautiful collection of bags, Grace Gordon (listed in our directory here) also sells a selection of well-chosen gifts including these beautiful handmade soy aromatherapy candles by Hobo. 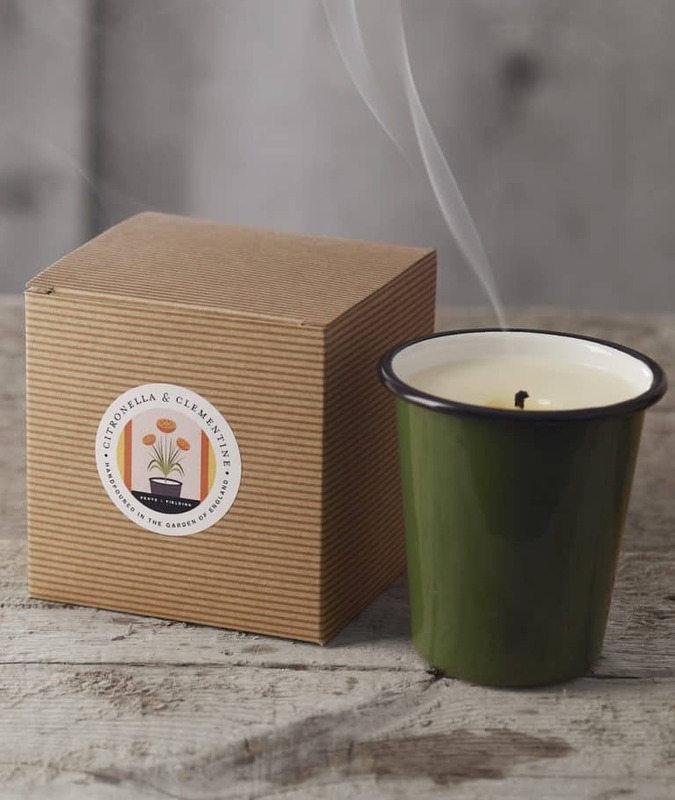 Hand poured in Lincolnshire, they are made with sustainable soy wax, essential oils, natural fragrance and a cotton wick. This Fig & Cassis candle combines fruity blackcurrant with warm ripened fig, to evoke a warm Mediterranean evening. 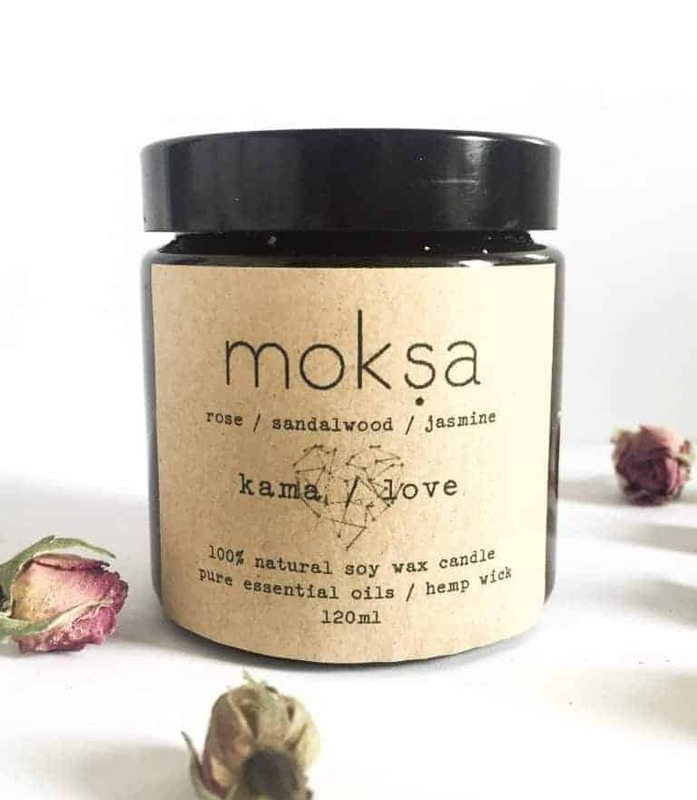 Devon-based Moksa (listed in our directory here) makes ethical and natural hand-crafted skincare and natural candles. All products are 100% natural , ethically sourced and hand made in small batches in Devon. 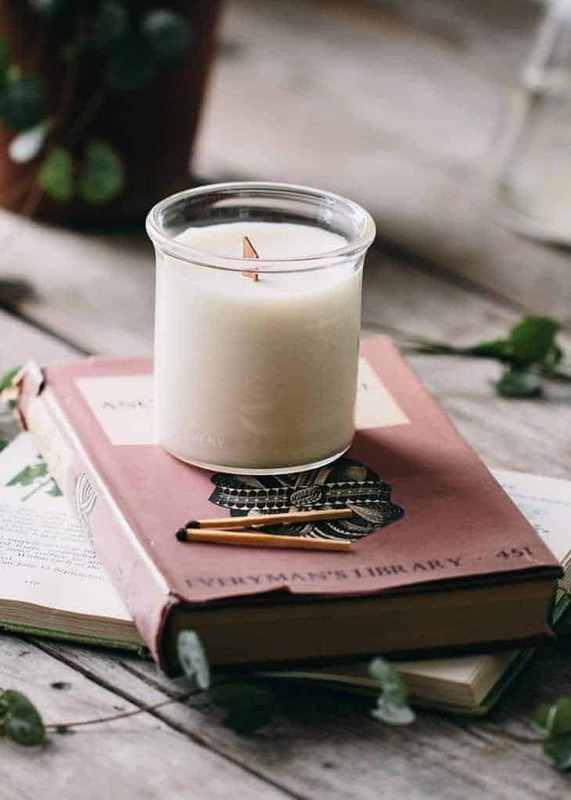 Surely the perfect handmade aromatherapy soy candle for Valentine’s Day – this is brimming with the headily fragrant essential oils of love – rose, sandalwood and jasmine. 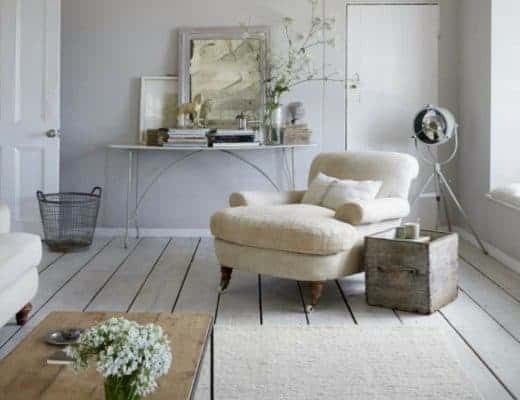 Just beautiful as well as ethical. Made with sustainable soy wax, pure essential oils, natural unwaxed hemp wick and no synthetic fragrances. They are also cruelty free and vegan friendly. 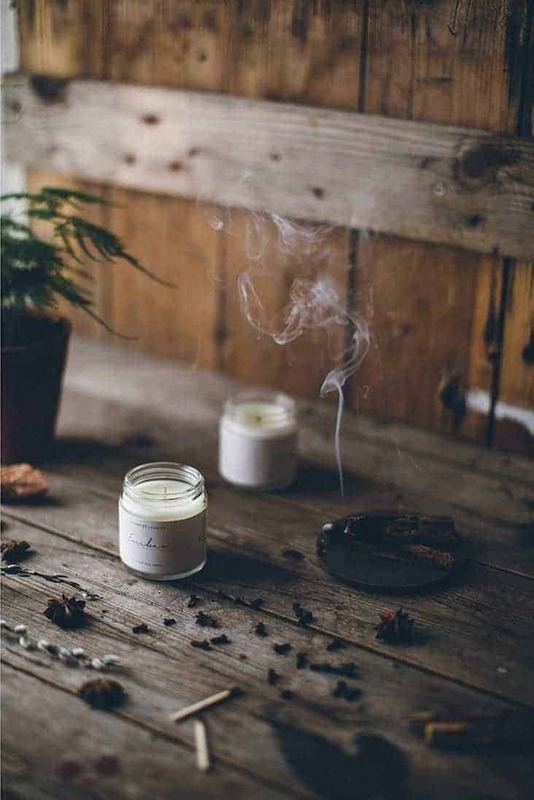 Listed in our directory here, Ermana is a range of skincare products as well as handmade soy aromatherapy candles made from botanicals and all things natural. Everything is hand made in small batches using high quality natural, organic ingredients ethically sourced from UK based suppliers. Lavender, geranium and ylang ylang pure essential oils are blended to balance body and mind. Hand poured using natural soy wax, rapeseed oil, geranium, lavender and ylang ylang essential oils and nothing else. Lavender is soothing and calming and great for balancing mood. Geranium (one of my favourite oils) is known for its uplifting effect on the senses and for calming the nervous system and aiding relaxation. Ylang ylang has a lovely delicate floral fragrance and cheering effect on mood. Comfort sounds like the perfect name for this! 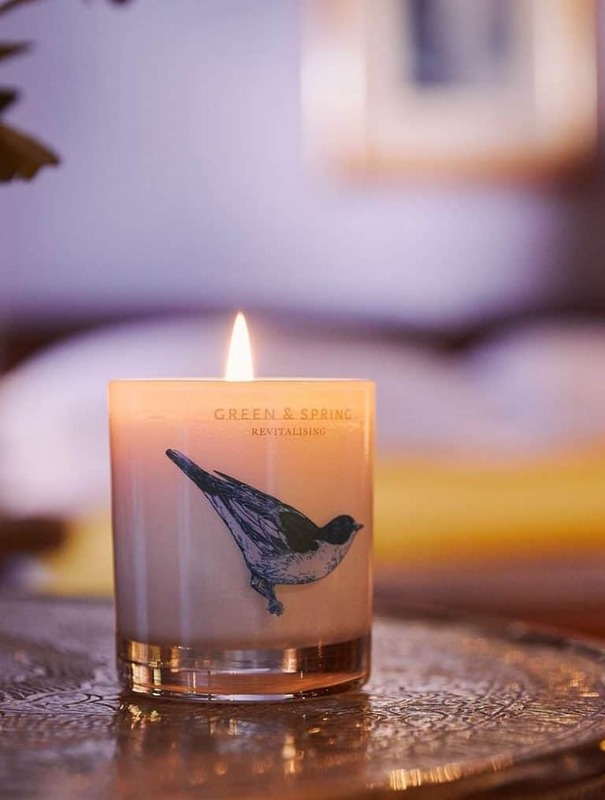 And I couldn’t blog about scented handmade soy aromatherapy candles without mentioning Green & Spring (listed in our directory here) who have been hand making natural, organic beauty and candles for years. 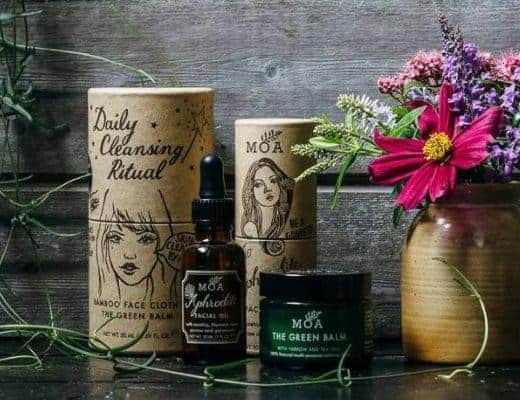 Using only 100% natural and ethically sourced botanical materials and herbal extracts sourced from the UK all Green & Spring products are free from parabens, SLS, SLES, PEGS, glycols, petrochemicals, synthetic colours and fragrances. Want to find more makers of handmade soy aromatherapy candles? 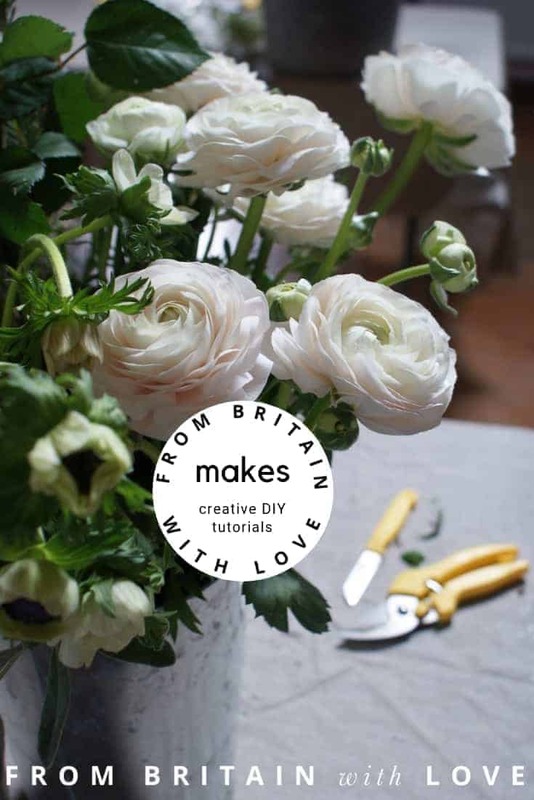 Check out the Candle Makers category of our hand-picked directory.